A Curriculum Developer plays a very crucial role in the education sector; they establish the topic, lessons, and materials that are to be taught by the Teachers at the Class. Some of the common tasks that are portrayed in the Curriculum Developer Resume are to make plans, research, develop, implement and revise the curriculum, order books, and materials. They also need to observe teachers and make necessary changes in their teaching style, observe the student performance, train the teachers, conduct orientation classes for teachers, interpret state guidelines and make necessary changes in the Academic Curriculum. Those willing to take this education path as their career need to emphasize on core skill sets like designing Curriculum expertise, IT skills, fluency in using a various referencing system like APA and excellent practical teaching experience. Extensive education is mandatory to apply for this post, and most successful resumes highlight a Master’s degree in Education. 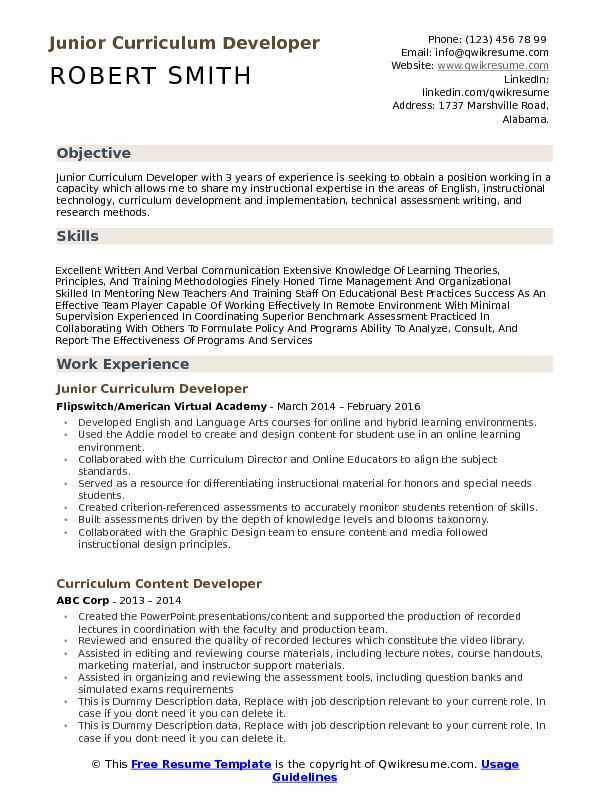 Objective : Junior Curriculum Developer with 3 years of experience is seeking to obtain a position working in a capacity which allows me to share my instructional expertise in the areas of English, instructional technology, curriculum development and implementation, technical assessment writing, and research methods. Developed English and Language Arts courses for online and hybrid learning environments. Used the Addie model to create and design content for student use in an online learning environment. Collaborated with the Curriculum Director and Online Educators to align the subject standards. Served as a resource for differentiating instructional material for honors and special needs students. Created criterion-referenced assessments to accurately monitor students retention of skills. Built assessments driven by the depth of knowledge levels and blooms taxonomy. Collaborated with the Graphic Design team to ensure content and media followed instructional design principles. Compiled, coordinated, and submitted data and to project manager to ensure timely course delivery. Provided quality assurance feedback on educational products to ensure courses met client needs. Analyzed state and client instructional needs to build appropriate course objectives. Incorporated operational procedures and best practices into course organization and delivery. Initiated and coordinated curriculum and instructional design projects. 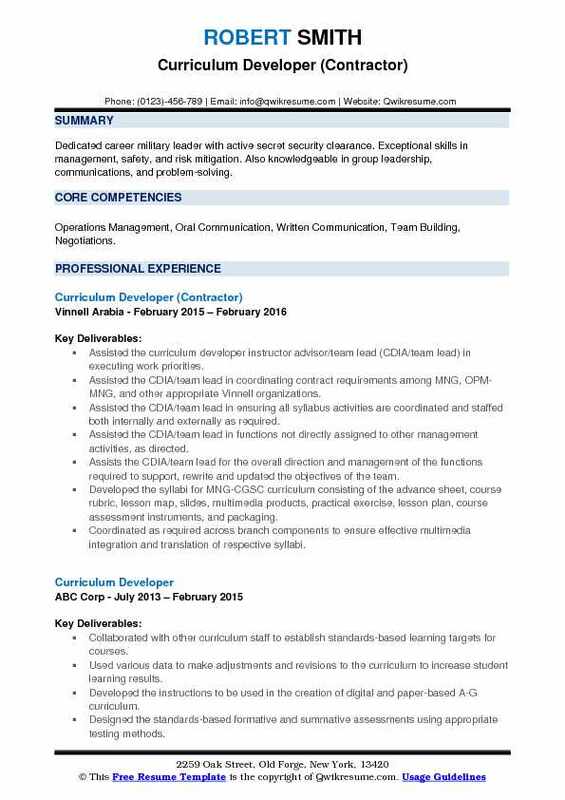 Objective : Dedicated career military leader with active secret security clearance. Exceptional skills in management, safety, and risk mitigation. Also knowledgeable in group leadership, communications, and problem-solving. Skills : Operations Management, Oral Communication, Written Communication, Team Building, Negotiations. Assisted the curriculum developer instructor advisor/team lead (CDIA/team lead) in executing work priorities. Assisted the CDIA/team lead in coordinating contract requirements among MNG, OPM-MNG, and other appropriate Vinnell organizations. Assisted the CDIA/team lead in ensuring all syllabus activities are coordinated and staffed both internally and externally as required. Assisted the CDIA/team lead in functions not directly assigned to other management activities, as directed. Assists the CDIA/team lead for the overall direction and management of the functions required to support, rewrite and updated the objectives of the team. Developed the syllabi for MNG-CGSC curriculum consisting of the advance sheet, course rubric, lesson map, slides, multimedia products, practical exercise, lesson plan, course assessment instruments, and packaging. Coordinated as required across branch components to ensure effective multimedia integration and translation of respective syllabi. Assisted with the administration and sustainment activities for the translation and multimedia teams. 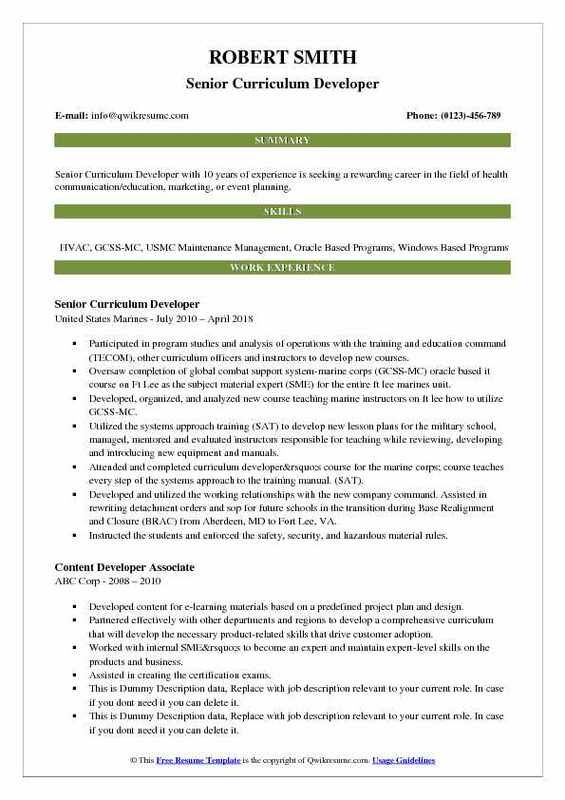 Summary : Senior Curriculum Developer with 10 years of experience is seeking a rewarding career in the field of health communication/education, marketing, or event planning. Participated in program studies and analysis of operations with the training and education command (TECOM), other curriculum officers and instructors to develop new courses. Oversaw completion of global combat support system-marine corps (GCSS-MC) oracle based it course on Ft Lee as the subject material expert (SME) for the entire ft lee marines unit. Developed, organized, and analyzed new course teaching marine instructors on ft lee how to utilize GCSS-MC. Utilized the systems approach training (SAT) to develop new lesson plans for the military school, managed, mentored and evaluated instructors responsible for teaching while reviewing, developing and introducing new equipment and manuals. Attended and completed curriculum developer’s course for the marine corps; course teaches every step of the systems approach to the training manual. (SAT). Developed and utilized the working relationships with the new company command. Assisted in rewriting detachment orders and sop for future schools in the transition during Base Realignment and Closure (BRAC) from Aberdeen, MD to Fort Lee, VA. Instructed the students and enforced the safety, security, and hazardous material rules. Prepared work plans and reports while coordinating with supporting agencies to ensure all grades are inputted correctly, awards handed out, and schedules are complete on time according to manuals and publications. Established and held all records for students and permanent personnel. Wrote awards and evaluates instructors and students. Submitted all paperwork in a timely manner. 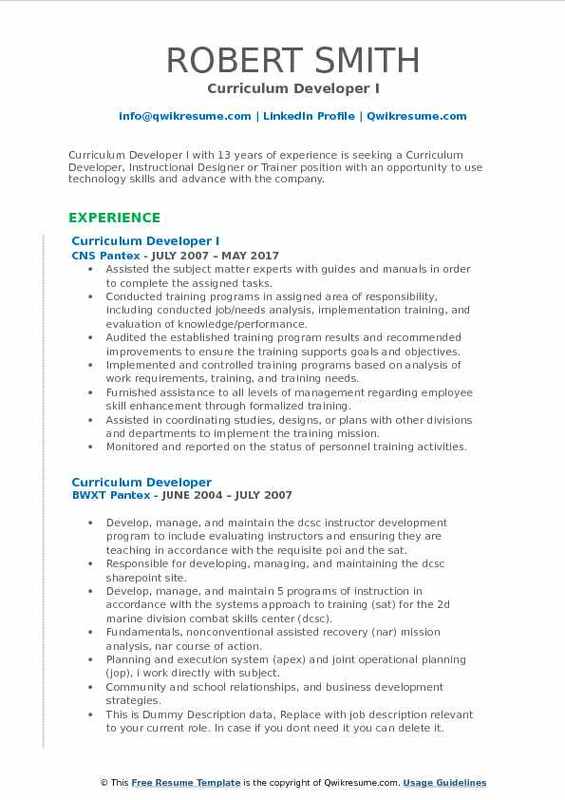 Summary : Curriculum Developer I with 13 years of experience is seeking a Curriculum Developer, Instructional Designer or Trainer position with an opportunity to use technology skills and advance with the company. Assisted the subject matter experts with guides and manuals in order to complete the assigned tasks. Conducted training programs in assigned area of responsibility, including conducted job/needs analysis, implementation training, and evaluation of knowledge/performance. Audited the established training program results and recommended improvements to ensure the training supports goals and objectives. Implemented and controlled training programs based on analysis of work requirements, training, and training needs. Furnished assistance to all levels of management regarding employee skill enhancement through formalized training. Assisted in coordinating studies, designs, or plans with other divisions and departments to implement the training mission. Monitored and reported on the status of personnel training activities. Prepared recommendations to meet quality, quantity, time and resource requirements. Accountable for all direct output assigned, and provided direct output support to management. Researched, formulated, and developed specific training programs and coordinates all training activates related to the security programs at Pantex. Taught the Department of Energy (DOE) the approved curriculum development and basic instructor training courses to the doe employees and contractors. Summary : Curriculum Developer II with 16 years of experience with highly effective leadership skills, coupled with creative problem-solving in emerging instructional and business opportunities. Expert instructional designer and trainer with solid managerial and technical expertise in non-profits, consulting and banking. Dynamic interpersonal and communication skills to gather requirements, learn quickly, and apply creativity to mission solutions. Created and implemented the first curriculum development framework using prioritization queue matrix. Wrote majority of two highest visibility national training programs in conjunction with in-house subject experts, legislative experts, and negotiation with the third-party vendor. Analyzed and re-wrote extensive program revisions for the National School Shield program. Formulated new methodology to implement in training counselor instruction courses. Wrote customer needs surveys and analyzed buyer personas to improve customer experience and attract new membership. Identified standardized training necessary for field operations personnel to drastically improve compliance and efficacy for nation-wide fundraising applications. Developed baseline instructional framework to streamline cohesiveness of program offerings for user experience. Provided instructional methodology improvements to law enforcement division, improving course delivery. Constructed new interactive training presentations for the adaptive shooting division to assist instructors and students with physical disabilities, providing inclusiveness and improving member experience in the sporting lifestyle. Led training projects and initiatives to develop curriculum by creating and maintaining project plans, while communicating progress and issues to stakeholders as required. Worked with the NRA general operations executive, NRA business executive and National Program managers to strategize, create and implement training solutions for at least six business divisions. 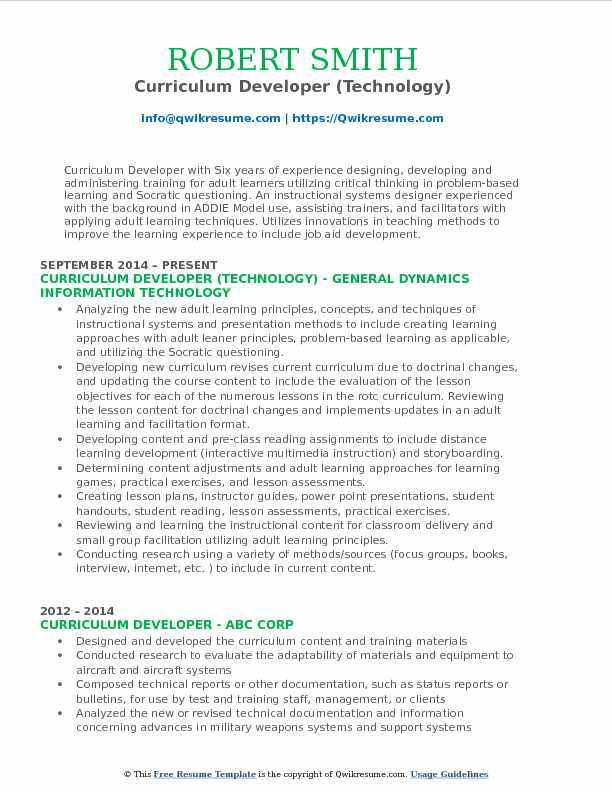 Summary : Online Curriculum Developer with 10 plus years of experience, combines cutting-edge, differentiated curriculum design in digital and print industries, with traditional and authentic assessment development for elementary and middle schools. Successful at conducting client needs assessments, determining a scope and sequence of skills and standards, establishing the driving content matter, developing and executing a product development plan. Established the digital English language arts curriculum offerings for the U.S students in third, fourth, and fifth grades. The initial challenge was meshing the available digital tools with the pedagogical needs of elementary students, and requesting new tools to be created. Researched and developed a three-year scope and sequence of standards and skills and implemented a backward design approach to generate over 1,000 hours of digital content. Increased marketability by spearheading a writing team to generate a complementary curriculum to meet the needs of gifted and advanced students, enabling the sales team to market materials to a wider number of potential clients. Added value to ELA curricula by playing a central role in the development of a curriculum supplement aimed at providing appropriate scaffolding for struggling students. Decreased the production time by devising innovative methods to use, and combine, existing templates on the content generation tools. Provided new materials for the Hebrew department by creating multiple storylines and relevant problems based on the existing amusement park theme. Increased student achievement by assisting in the development of a review component which intuitively cycled students through sets of spiraled practice skills, helping teachers determine areas for reinforcement. Coached teams of teachers in best practices, constructivist learning theory, and curriculum implementation using a digital teaching platform (DTP). Primary directive was the creation of all training materials, instigating a pilot, and revising the training materials within tight deadlines. Increased usage time and data acquisition by coaching teams of math and ELA teachers in planning the incorporation of time to know materials into their daily and long-range lesson plans. Headline : Curriculum Developer with Six years of experience designing, developing and administering training for adult learners utilizing critical thinking in problem-based learning and Socratic questioning. 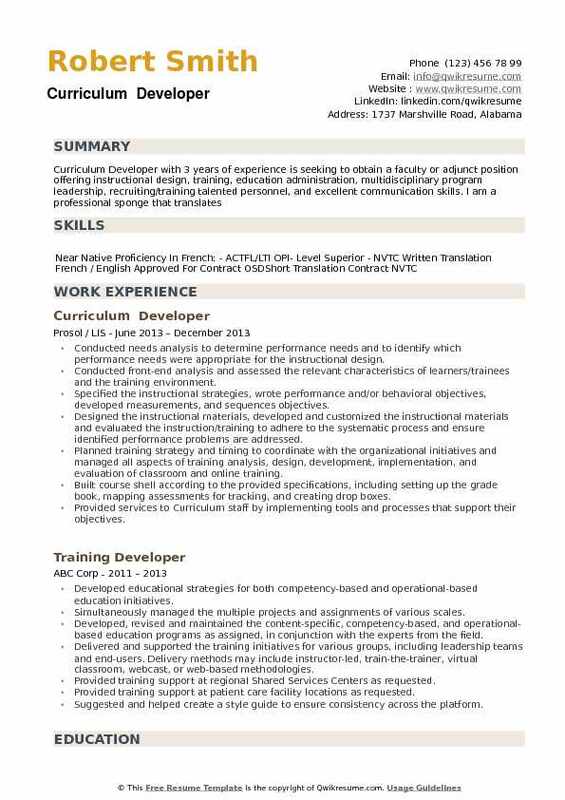 An instructional systems designer experienced with the background in ADDIE Model use, assisting trainers, and facilitators with applying adult learning techniques. Utilizes innovations in teaching methods to improve the learning experience to include job aid development. Analyzing the new adult learning principles, concepts, and techniques of instructional systems and presentation methods to include creating learning approaches with adult leaner principles, problem-based learning as applicable, and utilizing the Socratic questioning. Developing new curriculum revises current curriculum due to doctrinal changes, and updating the course content to include the evaluation of the lesson objectives for each of the numerous lessons in the rotc curriculum. Reviewing the lesson content for doctrinal changes and implements updates in an adult learning and facilitation format. Developing content and pre-class reading assignments to include distance learning development (interactive multimedia instruction) and storyboarding. Determining content adjustments and adult learning approaches for learning games, practical exercises, and lesson assessments. Creating lesson plans, instructor guides, power point presentations, student handouts, student reading, lesson assessments, practical exercises. Reviewing and learning the instructional content for classroom delivery and small group facilitation utilizing adult learning principles. Conducting research using a variety of methods/sources (focus groups, books, interview, internet, etc. ) to include in current content. 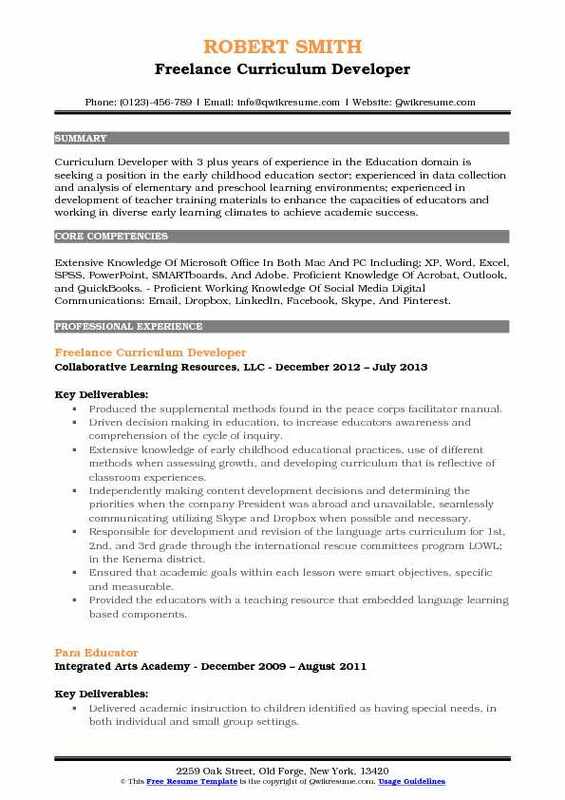 Objective : Curriculum Developer with 3 plus years of experience in the Education domain is seeking a position in the early childhood education sector; experienced in data collection and analysis of elementary and preschool learning environments; experienced in development of teacher training materials to enhance the capacities of educators and working in diverse early learning climates to achieve academic success. 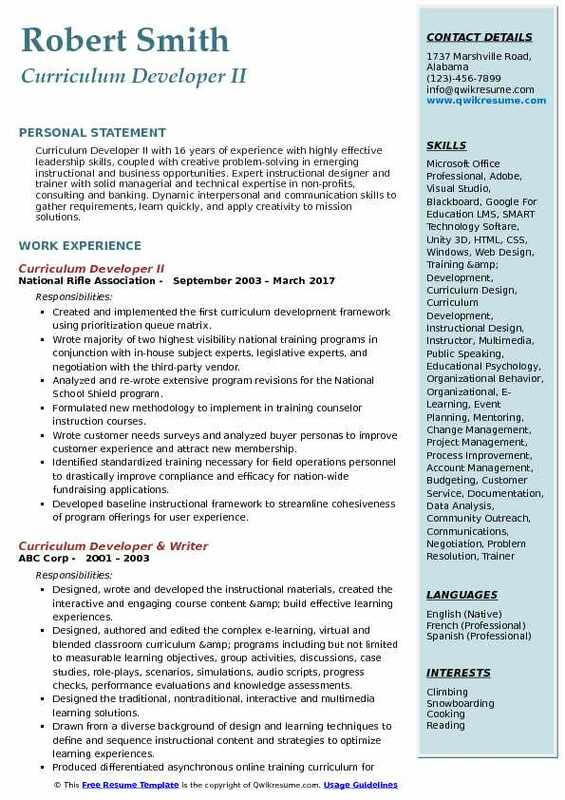 Skills : Extensive Knowledge Of Microsoft Office In Both Mac And PC Including; XP, Word, Excel, SPSS, PowerPoint, SMARTboards, And Adobe. Proficient Knowledge Of Acrobat, Outlook, and QuickBooks. 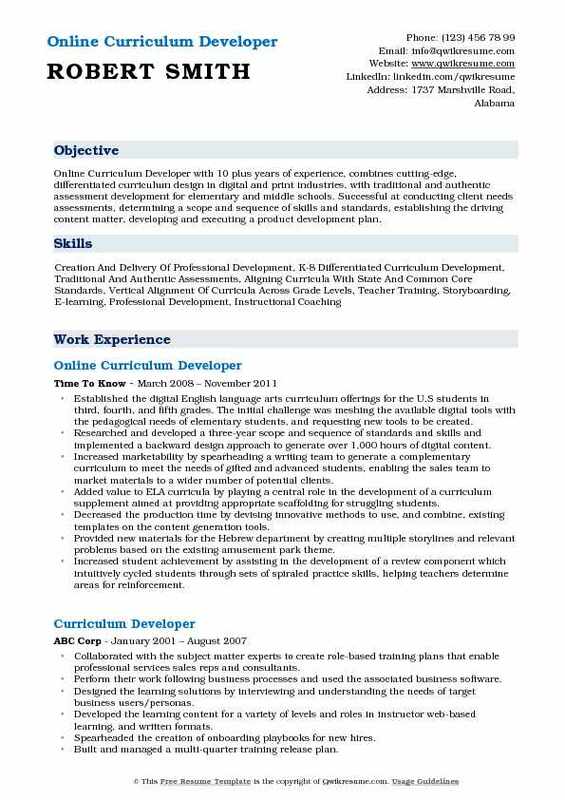 - Proficient Working Knowledge Of Social Media Digital Communications: Email, Dropbox, LinkedIn, Facebook, Skype, And Pinterest. Produced the supplemental methods found in the peace corps facilitator manual. Driven decision making in education, to increase educators awareness and comprehension of the cycle of inquiry. Extensive knowledge of early childhood educational practices, use of different methods when assessing growth, and developing curriculum that is reflective of classroom experiences. Independently making content development decisions and determining the priorities when the company President was abroad and unavailable, seamlessly communicating utilizing Skype and Dropbox when possible and necessary. Responsible for development and revision of the language arts curriculum for 1st, 2nd, and 3rd grade through the international rescue committees program LOWL; in the Kenema district. Ensured that academic goals within each lesson were smart objectives, specific and measurable. Provided the educators with a teaching resource that embedded language learning based components. Summary : Curriculum Developer III, translator, and teacher of Spanish educational curriculum specialist with 20+ years distinguished experience with an excellent combination of educational, professional and management skills with the sense the effective integration of the intellectual, physical, social, and emotional development as a learning process. Analytical thinking and operational experience have promoted the development of effective processes and business policy. 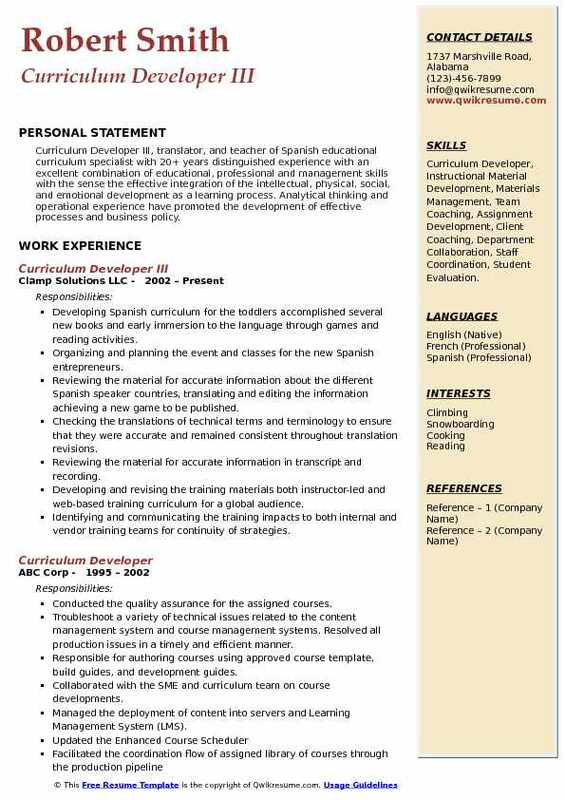 Skills : Curriculum Developer, Instructional Material Development, Materials Management, Team Coaching, Assignment Development, Client Coaching, Department Collaboration, Staff Coordination, Student Evaluation. Developing Spanish curriculum for the toddlers accomplished several new books and early immersion to the language through games and reading activities. Organizing and planning the event and classes for the new Spanish entrepreneurs. Reviewing the material for accurate information about the different Spanish speaker countries, translating and editing the information achieving a new game to be published. Checking the translations of technical terms and terminology to ensure that they were accurate and remained consistent throughout translation revisions. Reviewing the material for accurate information in transcript and recording. Developing and revising the training materials both instructor-led and web-based training curriculum for a global audience. Identifying and communicating the training impacts to both internal and vendor training teams for continuity of strategies. Interfacing with the business process leaders to ensure that curriculum supports customer satisfaction goals. Developing and managing the assigned curriculum from initial development to participant assessments utilizing a variety of media and teaching methodologies, e.g. , web-based learning management system courses. Conducted needs analysis to determine performance needs and to identify which performance needs were appropriate for the instructional design. Conducted front-end analysis and assessed the relevant characteristics of learners/trainees and the training environment. Specified the instructional strategies, wrote performance and/or behavioral objectives, developed measurements, and sequences objectives. Designed the instructional materials, developed and customized the instructional materials and evaluated the instruction/training to adhere to the systematic process and ensure identified performance problems are addressed. Planned training strategy and timing to coordinate with the organizational initiatives and managed all aspects of training analysis, design, development, implementation, and evaluation of classroom and online training. Built course shell according to the provided specifications, including setting up the grade book, mapping assessments for tracking, and creating drop boxes. Provided services to Curriculum staff by implementing tools and processes that support their objectives.